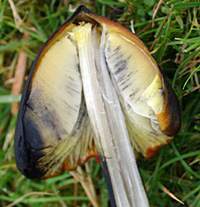 Commonly known as the Blackening Waxcap, this very variable grassland mushroom is one of several species whose caps turn black with age; however, it can be readily distinguished from other similar waxcaps by its long-lasting fruitbodies which, once mature, turn jet black all over and then can remain standing for many weeks. Hygrocybe conica sometimes appears in lines along roadside verges, particularly on hillsides or where the grass is well shaded, moist and mossy. Although undeniably beautiful when seen in bright sunshine, these conical waxcap fungi look just as good in wet weather, when they stand out boldly against the green background of their grassland habitats. Blackening Waxcaps can be red, orange, yellow or, of course, jet black. Sometimes you will see all of these colours in a group and occasionally in a single cap. Equally varied are the shapes of the caps: some remain stubbornly sharply conical while others gradually open, out occasionally becoming almost flat but always retaining at least a slight central umbo. Fortunately in Britain and Ireland we get plenty of practice in recognising Blackening Waxcaps in all their many forms and colours, because next to the Ivory Waxcap Hygrocybe virginea they are the most common of the waxcaps found in northern Europe. Localised in Britain and Ireland due to most grassland habitats being 'improved' so that they are too rich in nutrients to support waxcaps; however, where they do occur Blackening Waxcaps are often abundant and seen in large trooping groups. Unimproved parkland, golf course margins, the embankments of water resources reservoirs and man-made boating lakes, and country churchyards are often spangled with these 'Tellytubby' Toadstools. Described scientifically in 1762 by pioneering German mycologist Jacob Christian Schaeffer, who gave it the name Agaricus conicus (at a time when most of the gilled mushrooms were included initially in the genus Agaricus), the Blackening Waxcap was transferred to the genus Hygrocybe by another German mycological giant, Paul Kummer, in 1871, when it acquired its currently accepted scientific name Hygrocybe conica. Hygrocybe conica is the type species of the genus Hygrocybe. The Hygrocybe group name was first published in 1821 by the great Swedish mycologist Elias Magnus Fries as a subsection of the then massive genus Agaricus. 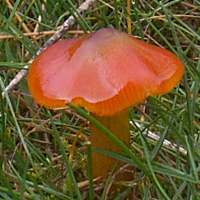 It was not until 1871 that Hygrocybe acquired genus status, a rank to which it was raised by the German mycologist Paul Kummer. This waxcap was also described and named by many of the pioneering mycologists, and so it has a plethora of synonyms. Among these are Agaricus tristis Pers. Hygrophorus conicus (Schaeff.) Fr., Hygrophorus tristis (Pers.) Bres., Hygrocybe tristis (Pers.) F.H. Møller, Hygrophorus olivaceoniger P.D. Orton, Hygrocybe olivaceonigra (P.D. Orton) M.M. Moser, Hygrocybe conica var. olivaceonigra (P.D. Orton) Arnolds, and Hygrocybe cinereifolia Courtec. & Priou. Witch's Hat is a name sometimes applied to the group of waxcap fungi that have sharply conical caps, and not surprisingly the specific epithet conica simply means conical. The carmine beauty of these little waxcaps is but transient, as they soon turn black all over, usually from the centre of the cap. If you touch the cap, gills or stem they soon turn black, so that specimens collected for later study soon look very different from the beautiful fungi found in the field. 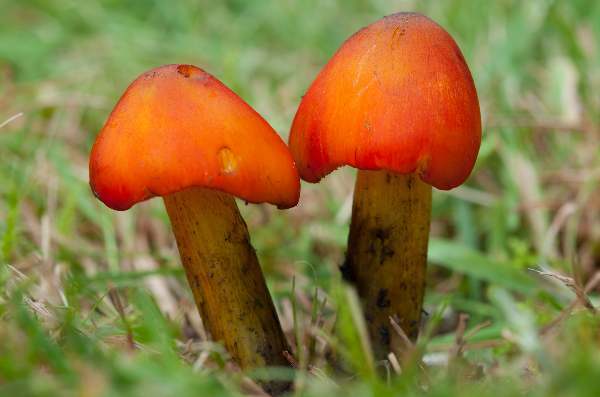 Blackening Waxcaps can appear remarkably quickly after rain in late summer and autumn, but once mature they remain standing sometimes for more than two weeks. 4 to 7cm in diameter; varying from an initial light orange to orange-red, often paler at the margin. The surface is greasy in damp weather but in dry weather it becomes dry and silky. The conical caps rarely open out fully and they soon turn black - at first in patches but eventually they blacken all over. Even when blackened the caps of these fungi remain quite shiny. The surface is very slippery in wet weather. The gills are at first a pale lemon yellow, becoming more orange and then blackening as the rest of the mushroom changes colour. 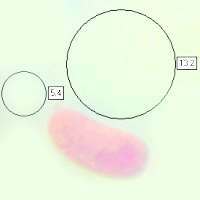 Basidia 2-, 3- or 4-spored. Cylindrical, 5 to 10mm in diameter x 4 to 10cm tall; no ring; initially yellow with a scarlet tinge near the cap but remaining much paler at the base; full, rather than hollow; flesh initially white but quickly turns black when cut. As the fruitbody matures, the whole stem blackens, usually from the top downwards. 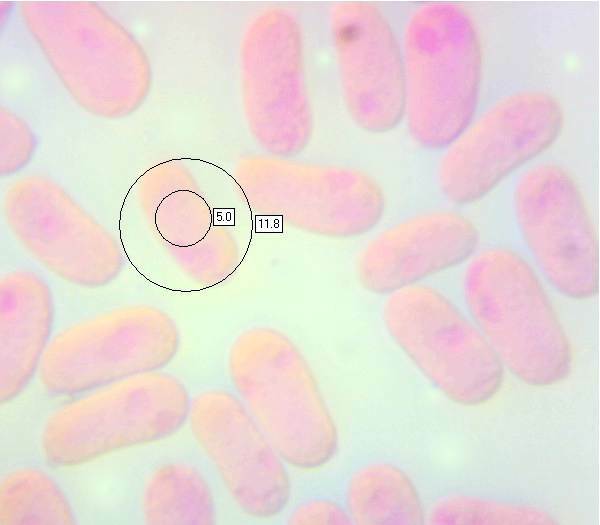 Some fruitbodies have mainly four-spored basidia, with clamps; others have mainly two-spored basidia (see left) without clamps. 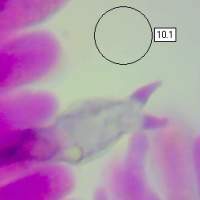 Ellipsoidal, smooth, 8.5-10 x 6-7µm; inamyloid. Ellipsoidal to oblong, smooth, 9-11.5 x 5.5-7.5µm; inamyloid. On roadside verges, in churchyards and on meadows and other areas of closely cropped or mown grassland where artificial fertilisers are not spread. 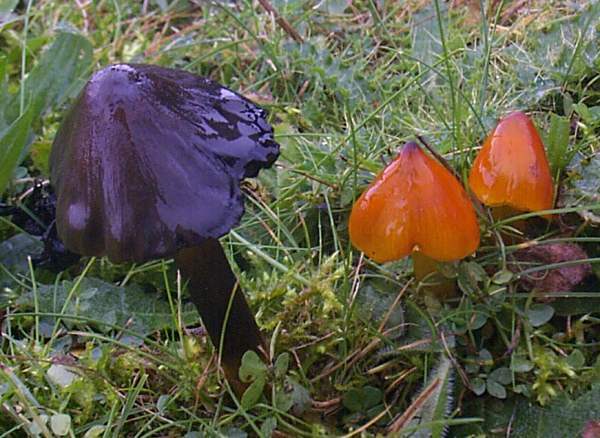 Hygrocybe punicea is similar in general appearance, but this species does not blacken. 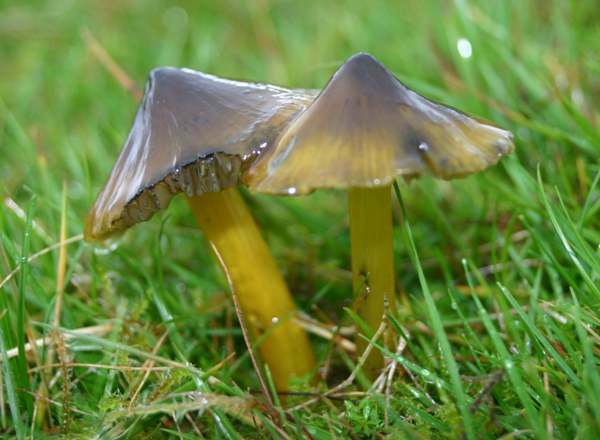 Hygrocybe conicoides, the Dune Waxcap, has yellow-orange gills and blackens much more slowly and rarely all over. 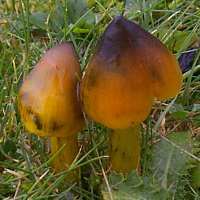 The Blackening Waxcap is one of the most common of the Hygrocybe species seen in Britain and Ireland, and it is fairly common also on a European scale. 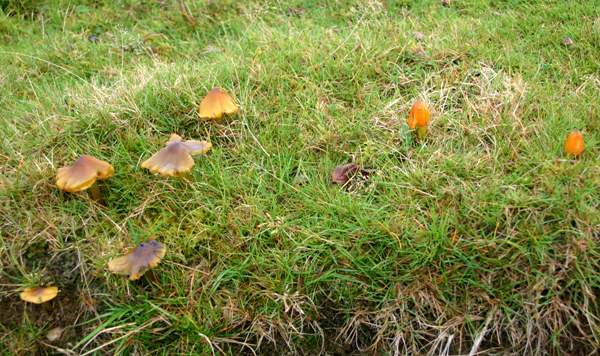 (The picture on the right shows Blackening Waxcaps along the bank of the River Teme near Knighton, on the border of Wales and England, where they occur in their hundreds in good waxcap years.) 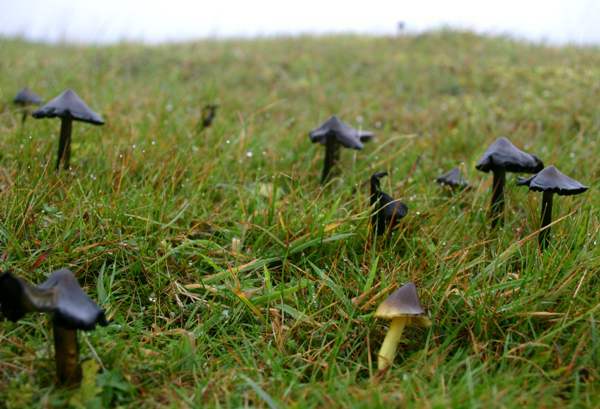 There would be rather less concern if people collected these grassland fungi rather than some of the rarer Hygrocybe species; however, although various field guides say that it is edible there is at least one report (from China) of mushroom poisoning attributed to this species. The fact that these insubstantial waxcaps are slimy and quickly turn black when handled is probably enough to deter all but the most fanatical (or famished) fungiphage from making a meal of Blackening Waxcaps.